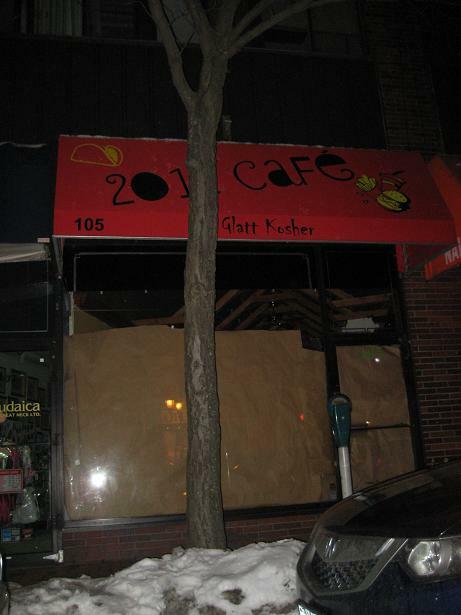 Cafe 2012 now open in Great Neck | Thanks a Glatt! This is the worst place. TERRIBLE service. Food was bad. This is not fusion, just Persian and Mexican food on the same menu. Ever heard of the saying, “Jack of all trades but master of none”? It took a long long time to get food (two wraps) for my wife and I. I had to go up and ask for the food multiple times. My wife got the wrong thing and we had to return it and wait for her dish. I couldn't pay at the table but rather had to go to the counter and pay. The lady at the counter did not know how much anything cost or where on the menu it was and I had to show it to her. Terrible experience and not even that cheap. Just go to Cho-Sen or Colbeh or Tel Aviv. If you really want Mexican then make the trip to Queens, you'll be glad you did. What a joke! My family ate here last night and the food was great. They have changed the menu. This place is good for families who want something other than the same old pizza for dinner–chicken fingers, hamburgers, burritos for the kids. The servings are big and generous. Service is friendly. We went there last night. They service was terrible. They are clueless. The staff piles their coats on an empty table. One of the servers wore her coat while working for the first half hour we were there. After 15 minutes they attempted to take order. They place was not staffed properly. The ‘waiter’ may have been the mashigach also, I’m not sure. He was so clueless he could only take our orders by number. When we asked questions about menu items he told us to read the menu. We informed him that some items did not have full descriptions. That being said of the six dinner items ordered 2 came out wrong. One of which we had to wait 10 minutes after everyone else was served. The food after it was served was pretty good. In order to get Vaad certification does the place have to be cluttered and a little dirty? I truly believe the operator of this place think they are doing a good job, because they do not know any better. Note: I eat at both kosher and non-kosher restaurants and eat out at least 7 meals a week. Early Jewish Brooklyn with a touch of Sephardic tackiness. 2012 used to be a non-Kosher Thai restaurant. They left the Thai ceiling and most of the Thai decorations and somehow made the leap that it was Mexican décor. They beads are still there on the back from the old owners. Supposedly Mexican Fusion. This place is Mexican that same way Bernstein’s on Essex was a Chinese place. NOT! They have a 6 page detailed menu. It is more of bar food than Mexican. Of course like every other Mexican restaurant, the serve French fries to every platter. Guess it is a Vaad requirement to up the caloric content of the meal to go along with the nachos.